If you want to be the emperor of the Halloween party scene this year then you need to have the right look. Something that says you’re large and in charge but also that you’re ready to party at the drop of a hat. We think this Mighty Caesar Costume perfectly says exactly that! Ruling the Roman Empire is one thing but having reign over an entire party on Halloween was thought to only be a dream, until now. Once you toss on the white tunic with its attached maroon drape, you will look and feel ready to take the throne. The gold lining all around the robe and sash will let everyone know you are royalty and not to be confused with a mere commoner. Along with the tunic, a gold cord belt is included to tie around the waist and better fit the costume to your body. Finally, rather than a heavy crown resting upon your head, a much classier golden leaf headpiece will top off this royal getup. Everyone will be yelling “Hail Caesar!” as you groove your way across the dance floor. Before you know it, you’ll have plenty of loyal subjects that will follow you into any party you wish to invade! Forget the Roman Empire this Halloween and spread your rule over the party scene in your town! 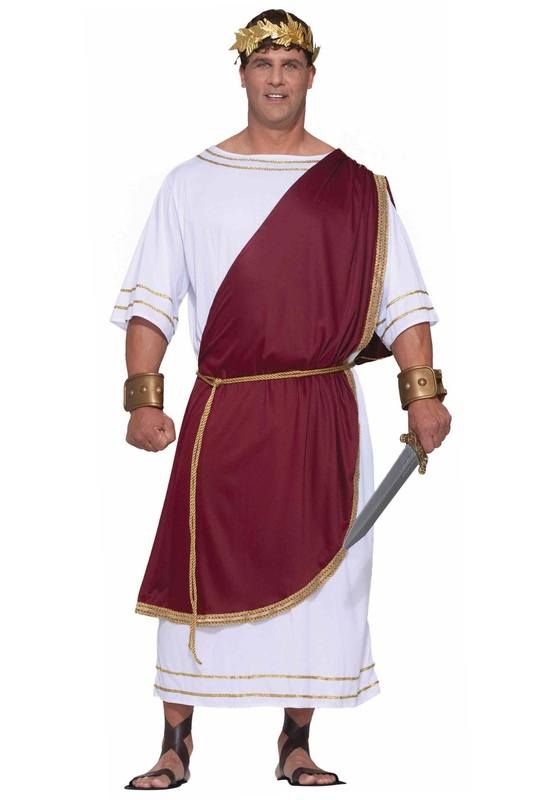 Grab this Mighty Caesar Costume and take a look through the Roman-themed accessories we have available. Grab a snazzy pair of sandals along with a mighty sword, just in case you need to lay down the law. After all, as an emperor, it is your duty to do so!